Visiting Pen yr Ole Wen, Carnedd Dafydd and Carnedd Llwelyn the three highest tops of the Carneddau. 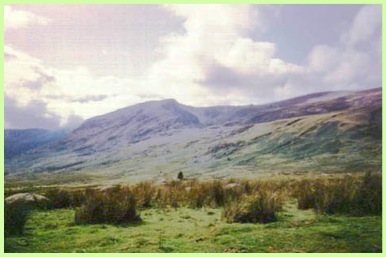 Although we had been in the Carneddau previously - a small ramble up to the top of Tal y Fan - when approaching this upland range from the A5 side you immediately appreciate their elevation. 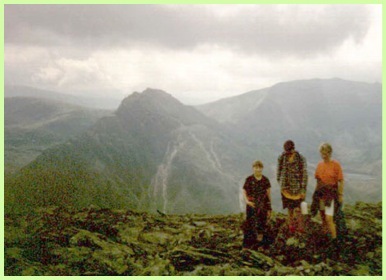 You also know that a walk on them will be memorable and, if the weather stays clear, give dramatic views. readers should now realise that once on top of Pen yr Ole Wen it is not a too undulating walk to bag the other peaks, but you’ve still got to get up Pen yr Ole Wen first. 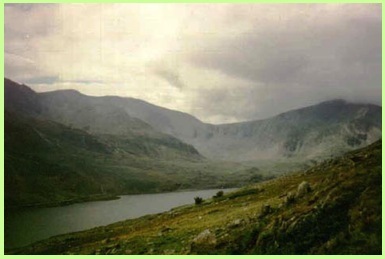 From the Ogwen Valley, which the A5 uses as its route between Capel Curig and Bangor, there are two main ways up Pen yr Ole Wen. One route starts almost opposite Ogwen Cottage and I understand is a very scrambly ascent. Indeed the path is supposedly so vague in parts that many guide books state that it is unwise to descend on this route if you have not used it to ascend. We, Anne, Greg, Ian and myself, therefore decided on the second option which started further up the road to the east of Llyn Ogwen. which side of the stream to be on. Indeed at times because of the many tributaries coming down the hillside from it I wasn’t too sure whether we were following the correct stream. 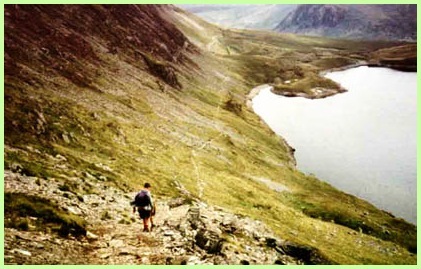 However, once over the marshy area the Afon Lloer became more obvious to follow but as we got nearer to its source, Llyn Lloer, we started to ascend the ridge up to Pen yr Ole Wen. Initially, if my memory is right, it wasn’t too difficult although after a while the path got less distinct but I knew the direction. It was west and up and up and up via one or two minor scrambles and we reached the top. was hot and I got warm I also got exceedingly damp. Wet backs aside, the views from the top of Pen yr Ole Wen across the A5 towards Tryfan, the Glyders and Y Garn were superb. I think that this lofty location is probably one of the best places to get really good views of the Glyders Range from. It was now easy time. 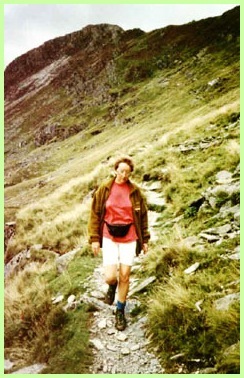 Once on the Carneddau Ridge it is comparatively level, and easy to navigate. We just followed the massive cairns that are along the ridge path and the next 3000-ft peak, Carnedd Dafydd, was soon reached. Mum I’d prefer not to know about it when he is doing it, but I’m quite interested to hear his exploits when it’s over. As this was our first big trip on the Carnedau I was unsure how difficult it all would be and also at that time I was not so knowledgeable about the lie of the land and other mountains in the vicinity. 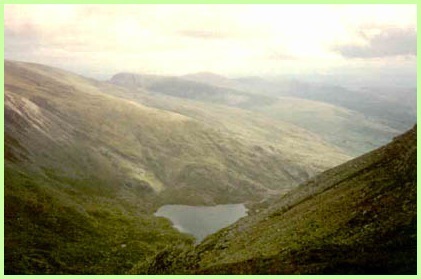 I therefore did not consider the minor diversion to conquer Y Elen, but I have done it a couple of times since. 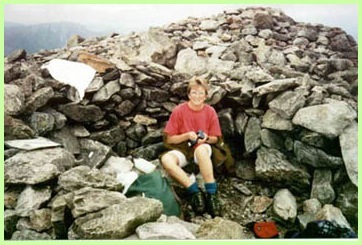 However, currently (June 2002) I have done all of the 20 highest Snowdonia Peaks except No.19, which is Pen yr Helgi du. 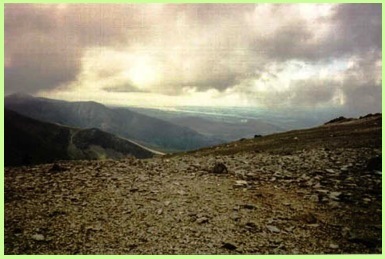 The sad thing is I was only a very short distance off the route we took from Carnedd Llywelyn. south as it descended towards the track that is used by the Water Board to get to Ffynon Llugwy Reservoir. If we had not descended here but continued further south along the ridge, although I understand it gets a little bit "Crib Gochish", within less than a quarter of a mile I would have ascended Pen yr Helgi du. From here I could have continued south to reach the A5 via a whaleback descent. As it was we continued down the Water Board track and from it we had superb views of Tryfan, the Glyders, Y Garn and Pen yr Ole Wen. Eventually we reached a leat, which is a large drainage ditch. This followed the contours along this part of the Carneddau. In retrospect we would have been better continuing along the Water Board Track as the route from the leat to the A5 took us through a farmyard. There were a few cows in it but as we got nearer we saw that one had got a ring through its nose and looked different in the genitalia department. But were we scared. Your damn right we were and so walked very fast, but casually, to the gate on to the road and fairly threw ourselves over it. A different end to a very enjoyable day but I do wish I’d done Pen yr Helgi du.